For the first time a team of scientists has tracked down the location of a fast radio burst (FRB), confirming that these short but spectacular flashes of radio waves originate in the distant universe. Animation showing how a team of scientists has tracked down the location of a fast radio burst (FRB), confirming that these short but spectacular flashes of radio waves originate in the distant universe. The breakthrough, published today in the journal Nature , was made using CSIRO radio telescopes in eastern Australia and the National Astronomical Observatory of Japan’s Subaru telescope in Hawaii. “Our discovery opens the way to working out what makes these bursts,” Dr Simon Johnston, Head of Astrophysics at CSIRO and a member of the research team said. FRBs emit as much energy in one millisecond as the sun emits in 10,000 years, but the physical phenomenon that causes them is unknown. This, and their apparently huge distances, have tantalised scientists since their discovery in 2007. Only 16 bursts have ever been found but astronomers estimate that they might occur 10,000 times a day across the entire sky. Today’s paper in Nature records a burst from a host galaxy around six billion light-years away. Importantly, it also confirms that FRBs can be used to find matter in the universe that had ‘gone missing’. Astronomers think the contents of the universe are 70 per cent dark energy, 25 per cent dark matter and 5 per cent ordinary matter. But when they add up the matter they can see in stars, galaxies and hydrogen gas, they still only find half as much ordinary matter as should be there - the rest has not been seen directly and so has been described as ‘missing’. Using the burst (FRB 150418) as a tool, the team were able to ‘weigh’ the universe, or at least the normal matter it contains. "The good news is our observations and the model match — we have found the missing matter," explained Dr Evan Keane from the SKA Organisation, lead author on the Nature paper. 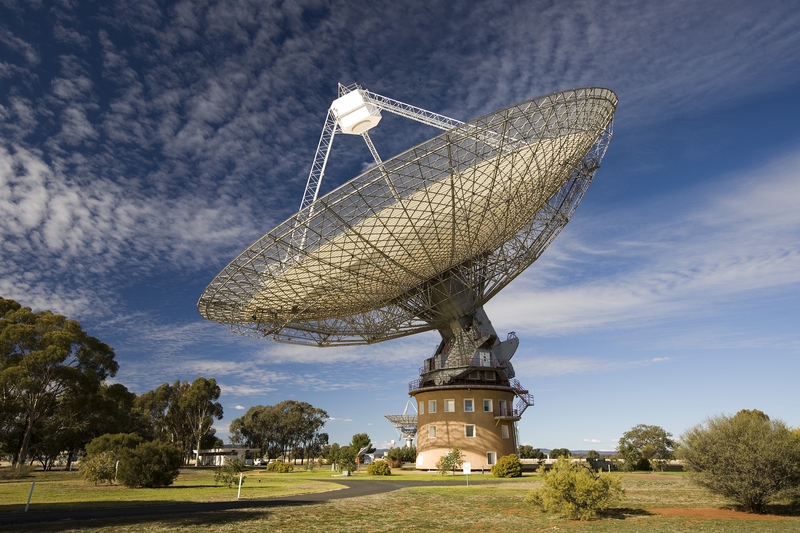 "It's the first time a fast radio burst has been used to conduct a cosmological measurement." Most FRBs have been found by sifting through recorded data months or even years after it was taken, by which time it was too late for follow-up observations. To remedy this, Dr Keane and his international team developed a system to detect FRBs within seconds, immediately alerting other telescopes with a view to pinpointing their location. 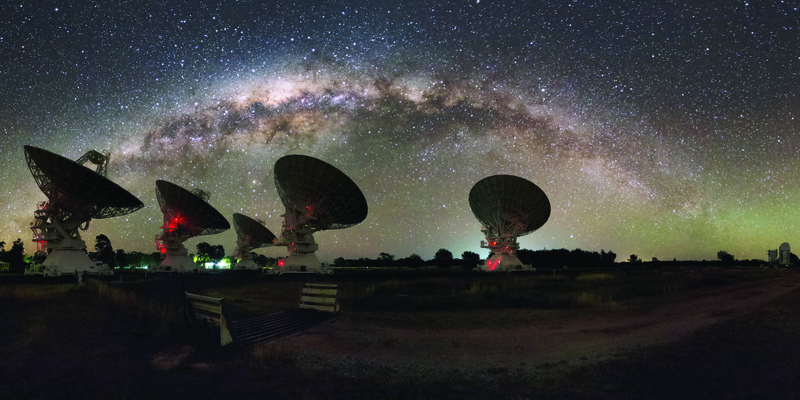 The Parkes telescope detected the new FRB on 18 April 2015 and two hours later, CSIRO’s Compact Array telescope (above), 400km north of Parkes, homed in on the patch of sky the flash had come from. It saw a radio source that lasted for six days before fading — the FRB’s radio afterglow. This let the researchers zoom in on the FRB about 1000 times more precisely than any of the 16 previously detected bursts. Meanwhile, in Hawaii the 8.2m optical Subaru telescope was also at work. Looking at the FRB field, it found a galaxy that could be matched with the radio source seen by the Compact Array. More sleuthing showed that this object was an elliptical galaxy — a huge football-shaped mass of stars. Its redshift (0.492) means that it is about six billion light-years away. The galaxy is old, well past its prime period for star formation. “This is not what we expected,” Dr Johnston said. But there could be more than one road to an FRB, he added. “In the near future, using CSIRO’s Australian SKA Pathfinder (ASKAP) should be ideal and ASKAP will be able to start looking for FRBs this year,” he said. Dr Simon Johnston, Head of Astrophysics at CSIRO.